I read and subscribe to so many blogs and forums, I could spend my entire day reading my email and get very little done. The protective coating of dust on my furniture is evidence of that truth. But hey, I love genealogy. Groups on Facebook are easiest for me to follow. 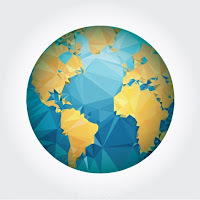 Facebook is almost a “one-stop-shop” for many genealogists. I am a member of quite a few of those groups and I always seem to find an interesting question someone has posted. I love to eavesdrop on the answers. Sometimes I will reply, or if I have recently read a blog on the topic I will post the URL link in the thread. 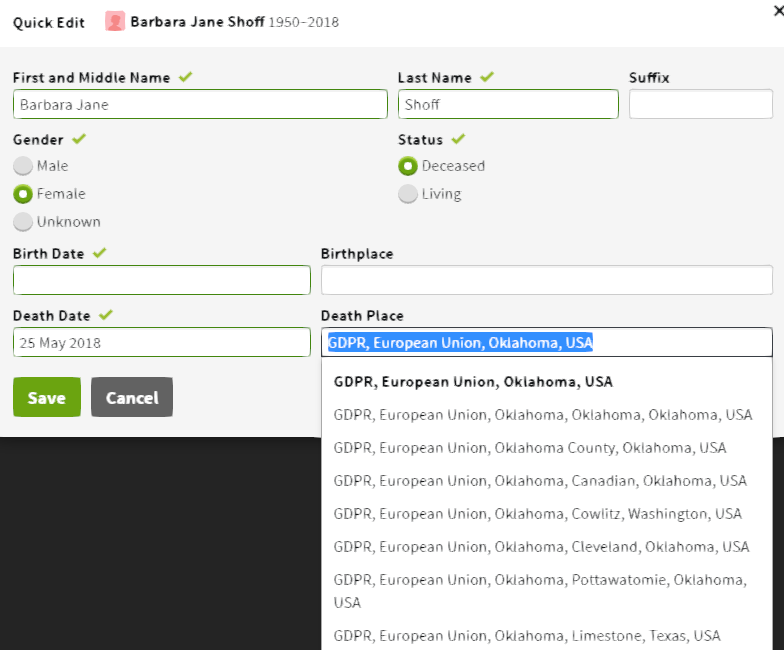 Blogs during the last week or so have been loaded with stories about genealogy sites making a mad dash to comply with the General Data Protection Regulation -- GDPR EU for short. There was much speculation about what the impact would be. It seemed there were news stories from everywhere about the darn law. The New York Times, NPR, Wired, DNAEXplained, Information Security Buzz, The Privacy Report. Those are just a very, very few. I was flooded with memories of Y2K. Would the world as we knew it come to an end? 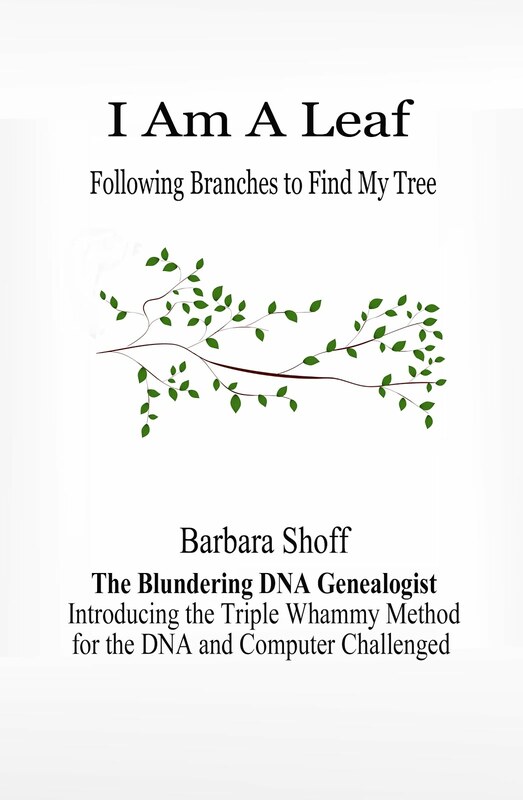 Many days and nights are spent bouncing between GEDmatch, various DNA testing sites, WikiTree, online courthouse records, census searches, pouring over spreadsheets, and studying segments in One-on-one comparisons. On May 25, 2018 many of us experienced in real life what GDPR meant to us. I was on GEDmatch when the reality hit me. I clicked on a few Gedcoms. Everyone’s Gedcoms had “Hidden Hidden” written all over them. If you or a dead ancestor didn’t have a death date, “Hidden Hidden” was in the place of the names. “Hidden Hidden,” screamed from the Gedcoms. I looked at my own. Oh dear heaven! I was HIDDEN HIDDEN! I took a break and poured myself a glass of Kombucha and sipped as I cruised around a few forums and Facebook groups. There were multiple threads about how difficult our research was now going to be. Everyone was commiserating with each other. I smiled. Fifty-one weeks after Y2K Oklahoma was hit with a huge ice storm. Most of the rural area where I lived at the time was two weeks without electrical power. I was finally able to clear out the last of my stores supplying many of my friends and neighbors. I was happy to reclaim that bedroom. If you are on GEDmatch and you click on a Gedcom it usually belongs to the person who is your match in the row where you clicked on the Gedcom. Their name will usually be the one in the Hidden position. You can copy and save the Gedcom information and add their name, alias, kit number and email address. Just copy the information from your One-to-many page. If you download your Gedcoms + DNA results into a spreadsheet, you can use User LookUp on the landing page and their Gedcom ID or copy their kit number and do a Ctrl+F on your One-to-many page and make a master sheet containing who goes to what Gedcom. As for me, I decided to make it easy for my matches. Hope you enjoyed this post. Questions for future posts always welcome. You are so smart and funny. Love your new book, so much good information in it! Jessica I am always happy to help.